I briefly explored in and around Birchip during the Hopetoun photo camp in July, looking for material for a large format photoshoot. Birchip is in the Wimmera–Mallee region of Victoria. It is situated in mostly wheat country, and it lies between Donald in the south, Sea Lake in the north, Hopetoun and Warracknabeal in the west and Boort and Wedderburn in the east. This is a pretty amateurish photo–it was exposed at midday using my Sony NEX-7 digital camera. This is not a good time to photograph using digital technology, especially when photographing into the sun. Hence the flare. However, the composition is okay, the picture suits the 5×7 format, and the softer light of the late afternoon or flat light would work. So the scoping has done its job. I have something to work on and work with. But how to do this photographically? 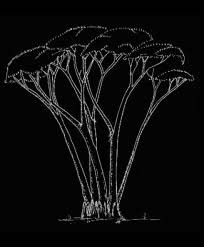 The scoping picture is a deadpan image of an unexpressive and repetitive subject that appears impersonal, blank and boring. 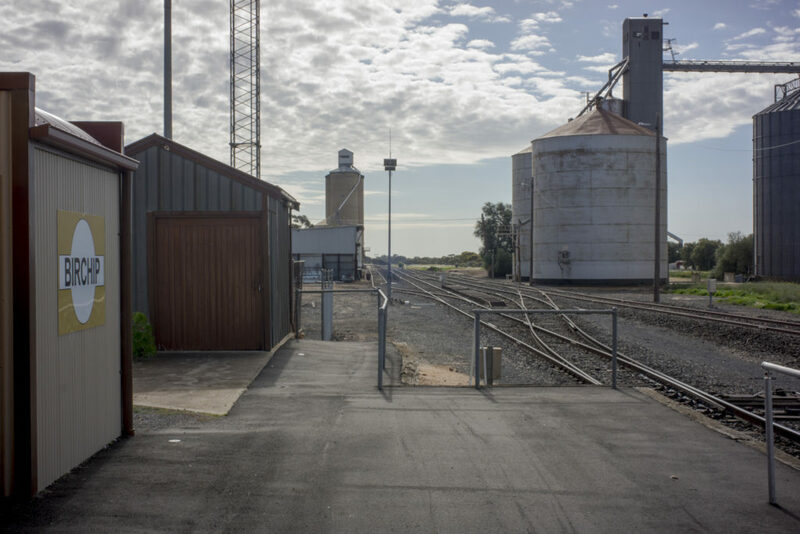 It repeats the same idea–silos in the landscape— in different ways whilst avoiding the artistic subjectivity and narrativity represented by photojournalism. There is no event in this picture, there is little human interest, and no first hand witness to pain and suffering associated with tragedies. It is not a subjective documentary of the auteur photographers such as Diane Arbus, Lee Friedlander and Gary Winogrand in the US or Carol Jerrems in Australia. Nor is it an architectural photograph that celebrates the building and the style of the master architect. Instead we have a cool, distanced view of ordinary, everyday subject matter that many would tend to characterise as ‘neutral’ or ‘objective’. For many it is the blank gaze of a deadpan photography –what you see is what you get. This is it. Most would see it as unexciting, emotionless, dull, flat and boring. Mind numbing. 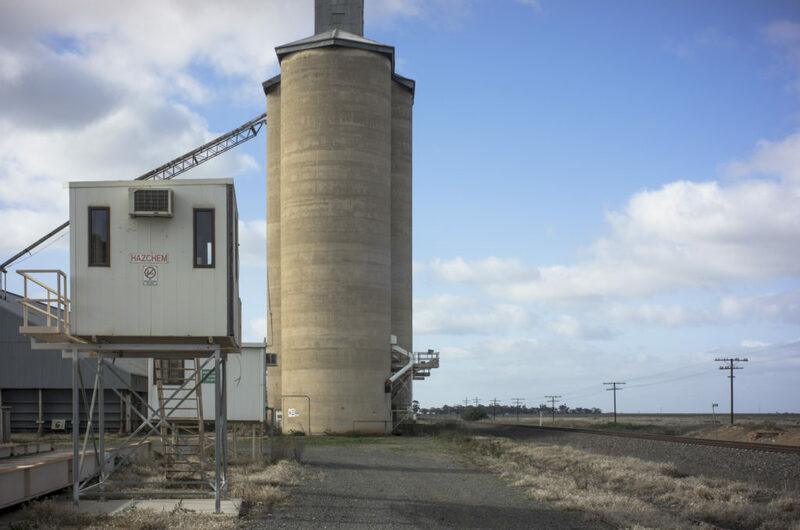 The silos are the vernacular architecture of the Mallee and they show the transformation of the regional space in Victoria as this agricultural architecture is situated within an altered landscape–industrial agricultural landscapes. The large format photographs of these simple, mass produced utilitarian buildings, which are everywhere in the Mallee, is in colour and so breaks from the black and white work of the 1970s US New Topographics. It refers back more to the colour tradition of Stephen Shore, Joel Sternfield, Joel Meyerowitz and Richard Mirasch who made colour a ‘respectable’ medium for art photographers in the 1980s. This is a photography that deploys the ‘straight’ aesthetic of the landscape tradition with its reliance upon classical composition, the camera’s disconcerting tendency to beautify the most nominally unprepossessing of subjects, and the illusion of transparency. There are two problems with the deadpan topographic directness. Firstly, it downplays the way that photographs are always coded, landscapes always read, and the constructedness of the photograph as text. The Mallee landscape is a set of images codified as a set of values (openness, progress, economic growth, community). Secondly, it conceals the hidden history of corporate power–the Mallee landscape is mostly private property criss crossed by highways and roads with some public conservation parks of Mallee scrub. The question of ownership is crucial. Who owns the places that the images depict? This is a photography that needs to address the politics of landscape representation and the concealment of power needs to address the politics of landscape representation and the concealment of power The topographic transparency, as it were, is part of the lexicon of concealment. Given this limitation of the conventions of the topographic landscape photography there is a need to reach beyond what is already there in the photograph. Travelling though these landscapes as a photographer means primarily looking for the light and the beautiful forms, even though every facet of the landscape is suffused with political implications. This landscape is littered with the tawdry evidence of twentieth century civilisation: – the petrol stations, the neon signs, the dingy cafes and bakeries, the ramshackle wooden housing, decaying sports fields, and the haphazard industrial developments. This is the detritus generated by the wholesale exploitation of nature to ensure economic growth. So the photos need to point to, or suggest, what is mission or overlooked.